The Always My Kitty Cherry Cremation Urn evokes memories of love and companionship with your cat. The sculpture has the look and feel of bronze, but is cold cast polymer with bronze additive and hand-finished with a bronze patina. 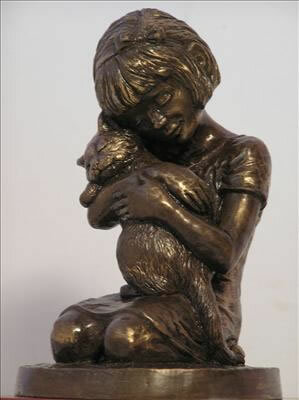 The scupture is crafted by the same professional artist that does our angel wingen puppy and cat urns. Each is made using a lost wax process. The base of the solid cherry urn is attached with four screws for easy loading.